Mitsubishi Heavy Industries recently contracted Mammoet to transport and install 120 pressure vessels and modules for the construction of Caribbean Gas Chemical Limited Methanol and DME Plant in southern Trinidad and Tobago’s Union Industrial Estate, La Brea. Following its completion, the facility is expected to produce 1 million tpy of methanol and 20 000 tpy of dimethyl ether, supplying next-generation clean energy and significantly contributing to the local economy. Over the course of one year, the major cargo was received in a total of 22 shipments. Mammoet’s scope included port handling activities, inland transport coordination and the customs clearance process inclusive of the 120 modularised vessel cargoes. This was a large-scale and complex logistics project, requiring thorough preparation and detailed planning to ensure safe and timely delivery. Using up to 96 axle-lines of SPMT, the cargo was temporarily staged and then transported to site for final installation. 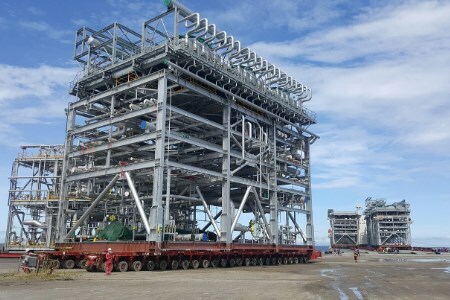 The heaviest vessel weighed in at 610 t and was tandem lifted by the company’s CC8800-1 and CC2800-1, while the heaviest reformer weighed in at 1 240 t and was set onto foundations by SPMTs. In addition to the major items, 561 containers and 200 000 t of general cargo from various ports in Trinidad and Tobago were successfully delivered.